Please bring a small calculator to this workshop. Calculators on your phone are acceptable. The Handwriting Assessment Workshop is an advanced level class. 8:00 a.m. Understanding Handwriting Curricula: Become a knowledgeable handwriting consumer. Compare handwriting curricula. Pre-K Readiness & Writing Assessment and The Screener of Handwriting Proficiency: Understand a developmental approach to assessing handwriting skills. Identify handwriting components that define handwriting legibility. Use results to enhance handwriting lessons, remediate or administer further testing. Preview The Print Tool: Learn about forms and materials. Develop a functional approach to understanding how and when to administer The Print Tool. Score The Print Tool: Utilize the Print Tool manual, Student Worksheets for Capitals/Numbers and Lowercase, Transparent Measuring Tool and Evaluation Scoresheet. Calculate scores. Write reports. 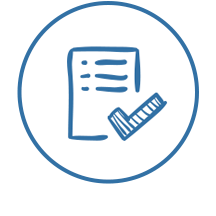 Use the Remediate Plan Worksheet to set goals, choose activities, and track progress. Benefits, eligibility, and requirements for becoming a certified handwriting specialist.